Reducing energy consumption by utilizing heat recovery systems has become increasingly urgent in industry. Heat pump technology is an ideal solution for this problem. Based on analysis of energy demand and waste heat discharged in the dyeing industry, a high temperature heat pump (HTHP) system with twin screw compressor is designed in this paper for heating the new dye liquor instead of vapour boiler. Experimental investigation on performance of this HTHP system presented in the real dyeing process is also carried out. In the whole heating process, the dyeing liquor temperature rising rate is controlled at 1.36 ℃/min due to the capacity regulation mechanism of screw compressor with slide valve, which is matched ideally with the requirement of dyeing industry. The measured data shows that the HTHP can stably heat the dyeing liquor up to 97.8 ℃ with a coefficient of performance (COP) as high as 3.9 in the high temperature condition. When switched to the moderate temperature condition, the HTHP can utilize waste water with an initial temperature of 75 ℃ to heating dyeing liquor from 30 to 80 ℃ with COP of 3.2-5.8. The total heating COP is 4.28 with an accumulated heating capacity of 102.8 kWh and the total energy consumption is 24.4 kWh. 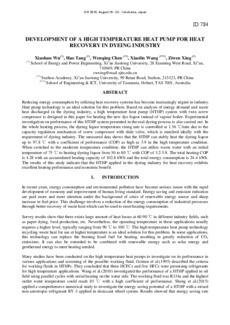 The results of this study indicate that the HTHP applied in the dyeing industry for heat recovery exhibits excellent heating performance and economic benefit.